Water bottles are so useful, I'm sure most of us have at least one in our kitchen cupboards. I use them a lot, both in the home and when I'm out and about. As a wheelchair user it can be awkward carrying glasses of water from one room to another, so after getting fed up of spilling my drinks everywhere I started to use water bottles instead. They are also very useful for taking cold drinks with you on walks, to work etc. 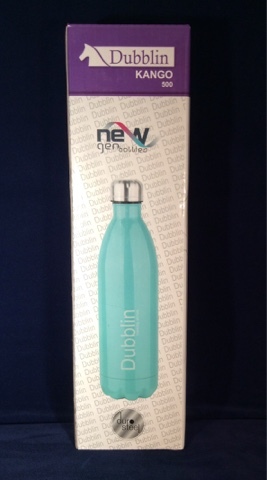 I was happy to have the chance to review the Dubblin stainless steel water bottle as I immediately liked the look of it when I saw it online. LEAK PROOF - Our air tight screw lid ensures your bag stays dry no matter how active your lifestyle is. BPA FREE - By using natural stainless steel as oppose to plastic we ensure your water is toxin free. TEMPERATURE CONTROL - With a thermal vacuum double wall built in, your liquid stays warm for 12h and cold for 24h. LIFETIME DURABILITY - With over 9 years of experience manufacturing water bottles, we source the most premium metals and ensure our production is exceptional. 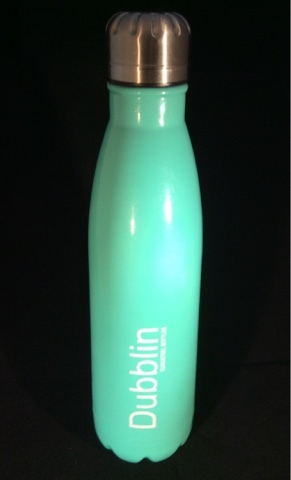 The Dubblin water bottle is available in a variety of colours, I chose mint blue and it looks great. I must say that this is a very stylish looking bottle, it looks much nicer than all of my other bottles. It has quite a tall, slender shape that even with my poor hand strength and dexterity is comfortable to hold. The lid is also easy to unscrew and it has a leak proof seal. I have tested this out my carrying it around in my wheelchair bag, and I've given it to my assistance dog to carry in his little bag for me when I needed my hands to propel my manual wheelchair. So far the leak proof claim has proved to be true, with no leaks at all, even when it was jostled around in the bag. This is very important to me as I've recently had a water bottle leak in my wheelchair bag and it a real pain as I find it difficult to clean out. As this bottle has a double thermal wall it will keep liquids cold or warm for a long time. The company claims it will keep cold drinks cold for 24 hour and warm drinks hot for 12 hours. I admit to being dubious about this but I've tested this claim and can confirm that it is 100% true - infact it kept my fruit juice cold for longer than 24 hours. It's so nice to be able to have a lovely cool drink when out and about in this hot weather we're currently having, it really does feel like you've just taken the bottle from the fridge. This bottle is slightly more expensive than I'd normally pay, but having compared this bottle to my usual cheaper bottles I'd definitely buy another one of these bottles at the full price. Cheaper bottles have proven to be a false economy as they never seem to last very long. The Dubblin stainless steel water bottle is top quality and very durable, I'd definitely recommend it. Stainless bottle can be used for the long time to keep cold and hot water. You can gift this Water Bottles to someone which is available at the best price.